Chemoprevention of cancer, especially by retinoids, rexinoids, and other ligands of the steroid receptor superfamily; peptide growth factors, especially transforming growth factor-beta (TGF-beta) and its mechanism of action; development of new natural products for prevention of cancer. Synthetic triterpenoids and rexinoids (RXR ligand) as anti-inflammatory, anti-oxidative, and anti-carcinogenic agents. 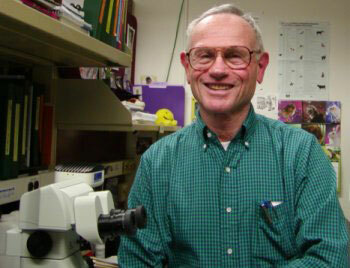 Dr. Sporn completed his undergraduate studies at Harvard College, majoring in biology, in 1952. He received his M.D. at the University of Rochester in 1959. Dr. Sporn then began his research career at the National Institutes of Health, where, in 1970, he was made the Head of the Lung Cancer Unit. In 1978 he became Chief of the Laboratory of Chemoprevention, where he remained until 1995, when he came to Dartmouth Medical School as the Oscar M. Cohn '34 Professor of Pharmacology and Medicine. Triterpenoids of an ursane or oleanane structure are widely distributed in nature, occurring in hundreds of plants all over the world. Many such structures have interesting biological, pharmacological, or medicinal activities, similar to those of retinoids and steroids, including inhibition of carcinogenesis and induction of differentiation in leukemia or teratocarcinoma cells. Ursanes and oleananes belong to a larger family of related terpenoids, many of which are ligands for the steroid receptor superfamily, such as retinoids and classical steroids. Testing Novel Pyrimidinyl Rexinoids: A New Paradigm for Evaluating Rexinoids for Cancer Prevention. Cancer Prev Res (Phila). 2019 Apr;12(4):211-224. doi: 10.1158/1940-6207.CAPR-18-0317. Epub 2019 Feb 13. Chemoprevention of Preclinical Breast and Lung Cancer with the Bromodomain Inhibitor I-BET 762. Cancer Prev Res (Phila). 2018 Mar;11(3):143-156. doi: 10.1158/1940-6207.CAPR-17-0264. Epub 2017 Dec 15. Synthetic oleanane triterpenoids enhance blood brain barrier integrity and improve survival in experimental cerebral malaria. Malar J. 2017 Nov 14;16(1):463. doi: 10.1186/s12936-017-2109-0. Epub 2017 Nov 14. Design, synthesis, and biological activity of second-generation synthetic oleanane triterpenoids. Org Biomol Chem. 2017 Jul 19;15(28):6001-6005. doi: 10.1039/c7ob01420a. Commentary on Eagle and Foley: "Cytotoxicity in Human Cell Cultures". Cancer Res. 2016 Mar 1;76(5):989-90. doi: 10.1158/0008-5472.CAN-16-0152. The Rexinoids LG100268 and LG101506 Inhibit Inflammation and Suppress Lung Carcinogenesis in A/J Mice. Cancer Prev Res (Phila). 2016 Jan;9(1):105-14. doi: 10.1158/1940-6207.CAPR-15-0325. Epub 2015 Nov 10. Novel synthetic pyridyl analogues of CDDO-Imidazolide are useful new tools in cancer prevention. Pharmacol Res. 2015 Oct;100:135-47. doi: 10.1016/j.phrs.2015.07.024. Epub 2015 Jul 31. Dimethyl fumarate and the oleanane triterpenoids, CDDO-imidazolide and CDDO-methyl ester, both activate the Nrf2 pathway but have opposite effects in the A/J model of lung carcinogenesis. Carcinogenesis. 2015 Jul;36(7):769-81. doi: 10.1093/carcin/bgv061. Epub 2015 May 4.